Washable, athletic styled boxer briefs with an integrated, absorbent, urinary incontinence pad. The patented triple layer composite technology provides ultra high absorbency, protection and ventilation. 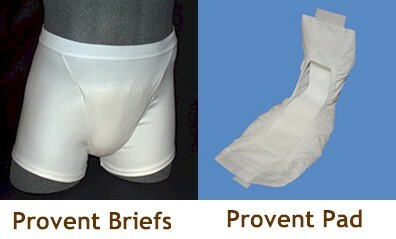 The Provent Briefs keep you dry with a combination of fabrics that are breathable, durable and reusable. The "spacer-mesh" top layer of the pad elevates skin away from wetness. The "ultra absorbent" interior layer wicks away and locks in moisture. The waterproof bottom layer prevents leaks with sealed edges. The pad attaches to the briefs with Velcro® tabs on either end. The tabs do not come into contact with the wearer's skin. 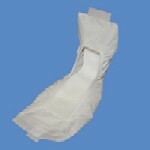 The 8 oz pad can be replaced with a 12 oz (.36 liter) pad if more absorbency is required. The boxer briefs are 96% comfortable cotton. The detachable, eco-friendly and innovative fold-out style pad allows you to easily exchange a soiled pad for a fresh pad throughout the day. Wash and reuse your boxer briefs and pads up to 300 times for a savings of up to 70% over disposable incontinence pads/briefs. Washable, reusable urinary incontinence pads used with Provent Briefs for Men or Provent Briefs for Women. Available in 8 ounce or 12 ounce absorbency. Washable, padded incontinence briefs for moderate male urinary incontinence. Built-in Absorb 2000 Pad with Fosshield Anti Microbial Fibers to control order. Functional fly. Reusable for at least 200 washings.